After our brief time in San Fran and a bit more training at Sugar Bowl, we headed out once again to Jackson Hole, Wyoming for races at Snow King. We had four days of races in the Wild West series – 2 Slalom and 2 Giant Slalom (27-30 January) but we arrived a few days early for some training preparation on the race hill and to gain a small advantage over most other athletes. My skiing has improved considerably however I made a few errors and didn’t put two clean runs together. After our last race at Snow King, we headed over to Big Sky, Montana, a few hours away, for two Super G races where it was -35°C so the first race was delayed a couple of hours as the lift wouldn’t operate. After the second Super G, we drove the 12 hours back to Truckee for a few days before departing for Winter Park, CO in the evening of February 9th. Here we raced 2 GS and 1 Slalom. I scored my second best points result in the first GS being a 35, unfortunately an error on the flats cost me dearly in slalom. After a good day of super g training on the race hill, we moved a little way down the road to Aspen for the NorAm super combined on the 17th. Snowing lightly ( -21 C) with a couple of inches of fresh snow delayed the start a little and added a bit of a challenge to a gnarly course but I managed to score super G points. Second run, I skied well in the slalom and scored in the super combined. I also scored my first NorAm points. Super fast course with speeds up around 120km/h in the fast sections! 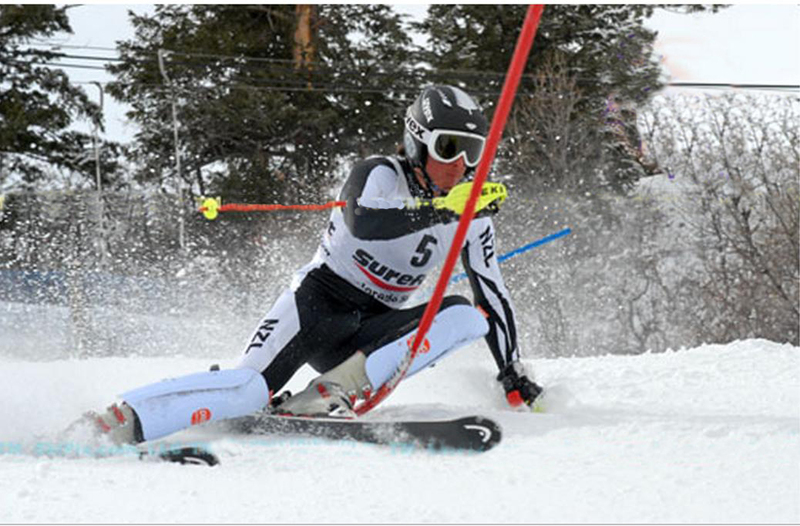 After day 2 of Super G we hit the road for Steamboat Springs (250kms) to race giant slalom the following day(19th). This was then followed by two slalom races where I was stoked to score my lowest points so far (35.00) and a bronze on the podium, before heading back to Truckee – round trip covering 3,540km! Around 12 feet of snow at Sugar Bowl over the last week of February! Will be heading out to Bogus Basin, Idaho for Western Region Junior Championship races starting 8th March so a little time for some good training and a little relaxing.